Published January 5th, 2008	in Money Saving Tools. 0 Comments	Tags: Police-Auctions, PropertyRoom, StealItBack. Apparently unclaimed baggage is not the only weird stuff you can buy online. Check out PropertyRoom, a company founded by former police officers in 1999 to sell lost, stolen or forfeited goods from police departments. Police has ran local auctions for ages where they sold the items that didn’t find their original owners. The idea behind PropertyRoom is to relieve the Police departments from the hassle and instead use internet to run these auctions online, similar to how eBay does it. The company works with more than 850 law enforcement agencies nationwide to collect, package and sell unreturned, found and seized goods in practically every category, from consumer goods to real estate, cars and boats. The website interface is kind of slow and smells 90’s but the company is for real and has been mentioned numerous times in press and on various Police websites including these LAPD and NYPD pages. Do not let the police badge in the website logo fool you. While auctioning off property from law enforcement departments may stay the core PropertyRoom business for a while, the management is vigorously looking for ways to expand the business. All that media coverage has been bringing millions of monthly visitors to PropertyRoom and to capitalize on the web traffic the company recently started to offer surplus equipment from police departments and municipalities. For example if you go to Automotive section you can find those Crown Victoria Police Interceptors starting at $700 a piece. The management didn’t stop there and to fill in high demand product categories such as Portable Electronics and Personal Accessories, PropertyRoom has signed contracts with many third party vendors which are now authorized to sell via the company auctions. In 2006 one half of the site’s gross sales came from these. A tip: use “Show only PropertyRoom Items” check box when you browse the auctions to filter out third party listings. StealItBack.com, a feature of PropertyRoom.com, gives anyone the ability to search for their stolen property online, free of charge. People can recover their goods by identifying a distinguishing mark, photograph, bill of sale or the item’s serial number. It is a very noble intent but unless you have the item serial number I seriously doubt you have a chance to recover anything. Manually running each item against a database of photographs and distinguished marks seems like extremely labor intensive procedure to me. Read more about StealItBack here. The variety of items featured on PropertyRoom is not typical for a regular online auction. 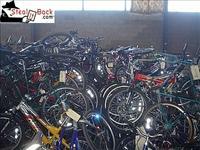 Just check out this bid of 444 used bikes. I would even say the site probably works best for the entrepreneurial kind of shoppers who intend to make money reselling stuff. If you exactly know what you want and you came to PropertyRoom with an intent to buy the thing right away - you are in the wrong place. The volume is not nearly there. That said, the fact that the auctions are not very popular works great for opportunistic bargain hunters and if you are looking in the right categories then you probably have a better chance to score a hot bargain than you do with eBay. Also note, there is a big difference between bidding on an item in eBay and PropertyRoom auction. With eBay, each seller is responsible for the accurate description and prompt item shipment. With PropertyRoom the company is in control of the listing which is certainly a relief of some sort. That said however the items are used (think “out of warranty”) and similar precautions must be used when buying them.